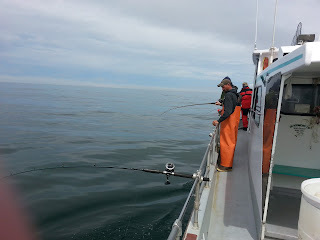 In August, some friends of ours were getting married, and as part of the wedding festivities, the groom took some of the guys on a fishing trip. Todd was one of the few that lucked out and got a salmon. I went along for the ride and spent some nice quiet time in the camper reading and catching up on emails and the like. It's always a nice thing to have some time to clear the old buffers out. It was a foggy/sunny day and it was the first trip we had taken with our new solar system. It was exciting to see that it did, in fact, keep the batteries fully charged even though I was watching television and using the lights. 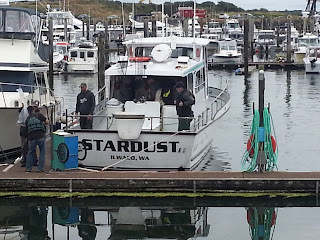 Later, I walked over to the marina and watched the guys come back in from their excursion on the STARDUST boat. They had a great time, even though there weren't a lot of fish caught. After that, we backed the camper up to a picnic area and enjoyed bbq'd hotdogs and baked beans and some amazing caramel corn that the bride makes that is so addicting it should be illegal. I told her not to send any more of it because I was convinced it was laced with heroin. The weather turned nasty after that for the drive home but it didn't matter, as they say, a bad day fishing is still better than a good day working.